Our Professional DJ’s keep your guests dancing all night long! 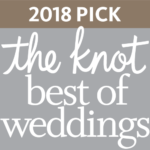 2018 theKnot Best of Weddings Winner. Let your wedding day shine! From simple accents featuring uplighting to large scale lighting productions, our lighting shines bright. Our Officiants specialize in creating personalized, unique wedding ceremonies that reflect your loving, commitment and vision of marriage! Say Cheese! Let your guests capture memories of a good time with our Photobooths. Let our photographers capture every moment of your wedding. Engagement photography also available! Replay your special day for days to come. Full and half day packages available.